Ignimbrite forms only during violent volcanic eruptions. Pyroclastic flows form on the mountain. The flows travel down the volcano's slope depositing pyroclastic material that forms welded tuff. Welded tuff forms during volcanic eruption when superheated gases and rocks explode out of a volcano forming pyroclastic flows. 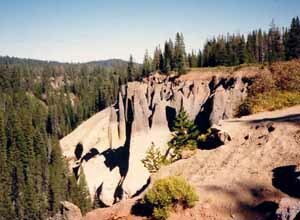 The Pinnacles in the picture above show the changes that occurred in the magma chamber beneath Mount Mazama during the climatic eruption that formed Crater Lake in Oregon. The light-colored rocks of rhyodactite lava formed at the beginning of the eruption. As eruption continued the magma chamber changed to andesitic lava that formed the darker-colored rocks. The superheated rock material that forms these rocks during pyroclastic flows develops layers of tuff and welded tuff. The top and bottom layers of rock are softer and resemble sedimentary rocks. The top layer forms as air above the super heated rock material cools forming tuff. Tuff is softer rock containing ash and pumice. The bottom layer of tuff is similar to the top layer and cooled because of the ground temperature. The interior of the rock deposit is insulated by the upper and lower layers of tuff. The super heated pyroclastic material deposited by the flows is insulated and cools much slower. The individual grains weld together forming welded tuff. The welded tuff is so hot that pumice flattens forming an oval shapes. Supervolcanoes erupt huge numbers of pyroclastic flows during an eruption covering large areas around the volcano with these rocks. Ignimbrite Learn more about these rocks that form during large volcanic eruptions that produce pyroclastic flows.